If you walk regularly, the Pet Gear Happy Trails Pet Stroller will make it very easy to take along your furry friend. It’s nice to have some company, and they will love the fresh air and new surroundings. Pet Gear is a trusted name in pet products. They have always been known for quality products at great prices, and this stroller is no exception. There are different types of pet strollers because they are specifically made for one purpose. For example, if you want to take your pet jogging, you should buy a jogger stroller. This is because the wheels are made differently, to give you and your pet the safest and most comfortable ride. The Happy Trails Stroller is made for leisurely walks. Both cats and dogs, as well as other small pets, love to ride in it. It is comfortable, and they can easily see their surroundings. If you are a jogger or hiker, a better choice may be the AT3 Generation II All Terrain Pet Stroller. It has bigger wheels and shock absorbers, which make the ride much smoother for your pet when going over rough terrain. In this review, we will talk exclusively about the Pet Gear Happy Trails Pet Stroller. You’ll find out everything that is included, including the size and color, and all of the added features. We will also tell you what other pet owners have to say about it in their customer reviews. Last, but not least, we will tell you how to get it. 1.2 What Are the Advantages & Disadvantages? The Happy Trails pet stroller will provide your pet with a safe and comfortable ride. It’s nice to be able to take your pet for a walk with you. You get to enjoy quality time together, and they will love the fact that they can see different people and places. 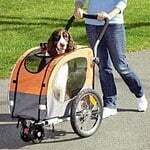 As a pet owner, you know that there are other things that a stroller must provide besides comfort for your pet. They have to be safe and sturdy, as well as be comfortable and easy for you to push. This stroller provides all of that, and more. It has a safety tether attached to the cabin so that you can clip it to your pet’s harness or collar. Harnesses are suggested because some animals don’t like anything attached to their collar, and will struggle with it. It has a fashionable Euro-Canopy, plenty of ventilation, and a large storage basket underneath the pet cabin for toys, treats, and other necessities. It also has a ‘parent tray’, perfect for holding a drink, your phone or keys. 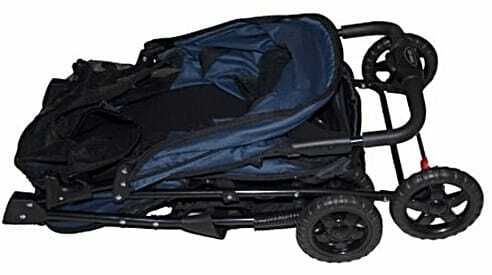 This stroller measures 37 x 8 x 15 inches on the outside, and 24 x 12 x 23 for the interior of the pet cabin. The size limit is 30 pounds. The actual weight of the stroller itself if 13 pounds, so it’s not very heavy, and it’s easy to push. CLICK HERE to Buy the Happy Trails Pet Stroller on Amazon! There are shock absorbers on the front, to ensure a smooth ride. Easy to fold with one hand, and can be easily stored. The cabin is surrounded by mesh windows. The netting can be unzipped and taken off. It has a safety tether attached to the bottom of the cabin. The liner is removable for easy cleaning. The wheels in both front and back are 6 inches. The back wheels have locking brakes. Some people have had trouble with the wheel assembly. Don’t use it on a rough or sandy terrain. Some pets were able to get out of the cabin by getting their paw in the tiny hole where the zipper ends. A word about measuring your pet for a stroller. Instead of measuring your pet with a measuring tape, an easier way would be to fold a towel or other cloth to match the length and width of the interior dimensions of the stroller. Simply put your pet on the towel, to make sure that they will fit well. Also, make sure to measure your pet’s height. 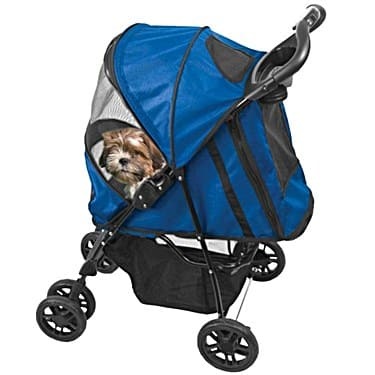 For the most comfort in the stroller, their head (when sitting) should be 2 to 4 inches from the top of the pet cabin. By taking these small steps to measure your pet, you will avoid the hassle of returning it and buying another size, if it should be too small. The Pet Gear Happy Trails Pet Stroller is currently among Amazon’s top-selling pet carriers. Some people have even put two small pets in there, and there is room enough for them to stand up, turn around, and be comfortable. 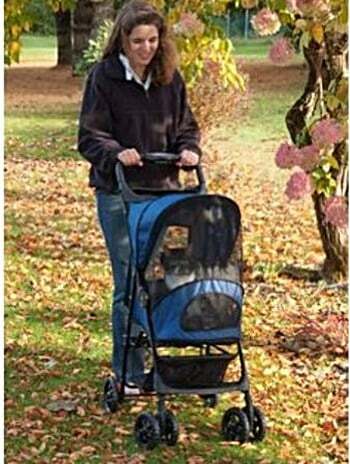 Owners of cats and kittens have a hard time finding a stroller for them. Some cats are very calm, and love to ride in a stroller. Others do like the ride but some felines aren’t too keen on being put in a carrier. People are saying that their cats like this stroller and a few have tried to get out, but couldn’t. You and your pet will love this stroller. Best suited for a leisurely walk, the two of you can be together while you get your daily exercise. The fresh air and different sights and smells are wonderful for your pet, as well. 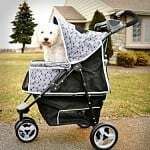 CLICK HERE to Buy the Pet Gear Happy Trails Pet Stroller on Amazon!